Percussionist Colin Currie and trumpeter Håkan Hardenberger have earned a reputation as fearless innovators. 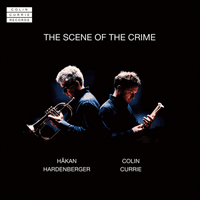 The charismatic and virtuosic duo have performed together for over a decade, and their first album on Colin Currie Records presents four works written for them alongside André Jolivet’s Heptade. The duo with Håkan Hardenberger is my musical safe space for maximum risk-taking. From my earliest point of connection with this most regal of musicians, what entranced me was the fearless audacity of the endeavour. Envelopes pushed, or simply reinvented, boundaries moved and canvasses recast. Rehearsals are intense; not many words spoken, a glance here or there, a certain type of breath taken, whilst the concerts are zones of feverish intensity, many-coloured and highly emotional. Too many now to pick out—San Francisco, Seoul, Verbier, London, the Hanover concert with three world premieres—I want to thank him for his encouragement, daring, humour and above all, friendship. Upon agreeing to make a duo of trumpets and percussion, we immediately took on the substantial ‘classic’ of that combination, André Jolivet’s wild and wonderful Heptade. With technical demands way beyond the quixotic, the work bends the rules for both players to highly contrasting effect over its seven movements. Given to mood swings, the work muddles up jazz elements, tight compositional process, mayhem and mystique, always overseen by a very French erudition. British composer Joe Duddell has written variously for me ever since my student days, when we met at the Royal Academy of Music. His music immediately put me on high alert, due to its direct melodic appeal, or indeed, its ‘catchiness’. Two concertos and several chamber works later, Håkan and I came to premiere Catch in 2011 (revised 2017). From his own side, the title has connotations with early music and the method of singing material in ‘rounds’ in quick succession. Furthermore, Duddell sought to maintain an equality in the musical argument between the marimba and the trumpet / flugel, thus diffusing notions of soloist / accompaniment. The three-movement work is wonderfully ear-grabbing, with the bop of the outer movements beautifully grounded by the slow, sombre centrepiece. Tobias Broström’s Dream variations is in three movements: ‘The dream’, ‘Mirror’ and ‘Déjà vu’. Its resonant percussion soundscape of gongs, vibes, tuned cowbells and other metals sets a somnambulant humidity for highly probing trumpet lines, searching tenderly, sometimes torridly for a way through the tone row. Initially, this group of pitches got stuck in the composer’s brain and he felt the need to 'speak them out loud'. These elements also combine here with Broström’s fascination with the Swedish painter Claes Eklundh, a feeling of unease and equivocation enduring until the very last statement of the theme, in this haunting, haunted work. Daniel Börtz’s duo uses extremes in an uneasy dialogue that explores timbral similarities between the forces by unconventional means. Its hair-raisingly hushed opening endures and endures, building up an enormous reservoir of tension, before matters are finally broken apart in a central section of great drama and conflict. For the entirety of the bongos vs trumpet engagement, each musician has their own rhythmic grouping—the trumpet’s threes jarring against the petulant groups of four from the drums. A wistful attempt at reconciliation happens thereafter, the trumpet finally achieving the flowing melody much sought after. The unease however, never quite dissipates. Our most recent premiere is Brett Dean’s … the scene of the crime …, a duo for drums and trumpets. In 2017, the composer was concluding a four-year focus on Shakespeare’s Hamlet for Glyndebourne opera, and this piece references two aspects of this Hamlet project: firstly, the mention of 'drums and trumpets' as the only music-specific stage directions in at least two early printed versions of Shakespeare’s text; and secondly, the geographic proximity of the world premiere at Håkan Hardenberger’s Malmö Festival just across the Öresund Strait from the supposed 'scene of Claudius’s crime' at the Kronborg in Helsingør, Denmark. Although the duo work does not share any musical material from the opera, the slow opening is very evocative and portentous. Thereafter, things do kick off somewhat, and with the percussion setting turning to drum kit, we find groove, beats and drive at the helm as the piece gallops over the line.